We truly live in amazing times. Thanks to the internet and mobile devices, the world is at our fingertips. It is hard to remember a time before smart phones. Now, both young and old have mastered the convenience that they offer. However, just when you got used to using your fingertips to control your life, the next big thing has arrived. Using your hands is so last year. Now is the time to voice your demands to your personal assistant, Alexa. Alexa is the virtual personality that lives in Amazon’s suite of smart speaker / screen products. These devices allow homeowners to search the internet, play music, and more with simple voice commands. While it may seem a novelty, Alexa’s ever-expanding skill set makes the devices harder and harder to live without. Not only can you order products, turn on lights, and make calls with them, but now with an Alexa thermostat, you can control the temperature of your home with your voice. The time has come to put down your cell phone, and raise your voice to say, “Alexa, Turn on the Air Conditioning! While it may seem like overkill to have your thermostat hooked up to your Amazon Alexa device, I assure you, it becomes second nature. It has been weeks since I last touched my thermostat. I’m afraid it might file for divorce for lack of attention. All jokes aside, it is awesome to just say, “Alexa, set temperature to 73˚”. She responds with a simple “OK” and the air conditioner in my Chicago home kicks on. Homeowners have many choices when it comes to choosing an Alexa thermostat. Manufacturers such as Ecobee, Honeywell, Nest, and more have all jumped aboard the home home automation train. While you may be partial to the Nest ecosystem of home products, I would suggest you consider installing an Aprilaire Model 8910W. This thermostat offers complete control over all aspects of your heating, cooling, and indoor air quality systems. In order for Alexa to do anything, you must teach her. 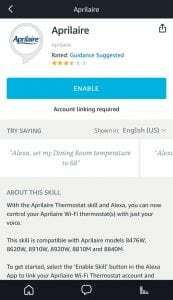 Alexa requires you to download certain “skills” to perform voice commands. Fortunately, Amazon makes the process very easy. 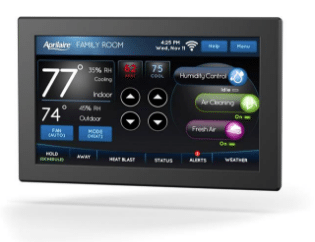 Once you have had a professional HVAC technician install your new thermostat and connect it to your wifi network, you will need to set up an account at Aprilaire’s website. Once you have done that, simply follow the steps below to complete the setup. Open your Alexa App on your smart phone or tablet. Search for Aprilaire in the Skills section. Enable the skill by following the onscreen instructions. Now you will have the ability to command Alexa to control your thermostat! Oh the Power!!!! While it sounds crazy telling the robot lady to turn down the temperature, it is an added convenience that you will wonder how you ever lived without. If you are ready to join this brave new world and would like to get the most out of your Amazon Echo, Dot, Show, etc, contact the professionals at Polar Heating and Air Conditioning. Polar has been installing quality indoor air quality equipment and HVAC system controls from Aprilaire for over a decade. Our partnership with Aprilaire allows us to guarantee the best prices on the latest technology. For a FREE estimate click or call 708-260-8855 today!